2. These appeals arise out of the common judgment and order dated 17th November, 2016 passed by a Division Bench of the High Court of Jharkhand in a batch of writ petitions relating to the regularisation of daily wage or contract workers on different posts. The writ petitioners (now appellants) were denied the benefit of regularisation in view of the provisions of the Jharkhand Sarkar ke Adhinasth Aniyamit Rup se Niyukt Ewam Karyarat Karmiyo ki Sewa Niyamitikaran Niyamawali, 2015 (hereinafter referred to as the Regularisation Rules). 3. The admitted position is that the appellants are irregularly appointed employees of the State Government. They sought regularisation of their status on the ground that they had put in more than 10 years of service and were therefore entitled to be regularised. The High Court took the view that the decision of the Constitution Bench of this Court in Secretary, State of Karnataka and Ors. v. Umadevi (3) and Ors.1 did not permit their regularisation since they had not worked for 10 years on the cut-off date of 10th April, 2006 when the Constitution Bench rendered its decision. According to the High Court, the Regularisation Rules provided a one-time measure of regularisation of the services of irregularly appointed employees based on the cut-off date of 10th April,2006 in terms of the judgment of the Constitution Bench. Therefore, since the appellants had not put in 10 years of service they could not be regularised. 4. The appellants had contended before the High Court that the State of Jharkhand was created only on 15th November, 2000 and therefore no one could have completed 10 years of service with the State of Jharkhand on the cut-off date of 10th April, 2006. Therefore, no one could get the benefit of the Regularisation Rules which made the entire legislative exercise totally meaningless. 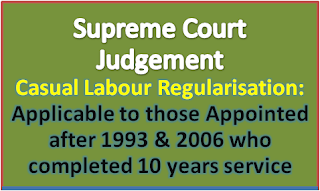 The appellants had pointed out in the High Court that the State had issued Resolutions on 18th July, 2009 and 19th July, 2009 permitting the regularisation of some employees of the State, who had obviously not put in 10 years of service with the State.Consequently, it was submitted that the appellants were discriminated against for no fault of theirs and in an irrational manner. 5. Having heard learned counsel for the parties and having considered the decision of the Constitution Bench in Umadevi (3) as well as the subsequent decision of this Court explaining Umadevi (3) in State of Karnataka and Ors. v. M.L. Kesari and Ors.2, we are of the view that the High Court has erred in taking an impractical view of the directions in Umadevi (3) as well as its consideration in Kesari. 6. The decision in Umadevi (3) was intended to put a full stop to the somewhat pernicious practice of irregularly or illegally appointing daily wage workers and continuing with them indefinitely. In fact, in paragraph 49 of the Report, it was pointed out that the rule of law requires appointments to be made in a constitutional manner and the State cannot be permitted to perpetuate an irregularity in the matter of public employment which would adversely affect those who could be employed in terms of the constitutional scheme. It is for this reason that the concept of a one-time measure and a cut-off date was introduced in the hope and expectation that the State would cease and desist from making irregular or illegal appointments and instead make appointments on a regular basis. “9. The term “one-time measure” has to be understood in its proper perspective. This would normally mean that after the decision in Umadevi (3), each department or each instrumentality should undertake a one-time exercise and prepare a list of all casual, daily-wage or ad hoc employees who have been working for more than ten years without the intervention of courts and tribunals and subject them to a process verification as to whether they are working against vacant posts and possess the requisite qualification for the post and if so, regularise their services. 10. At the end of six months from the date of decision in Umadevi (3), cases of several daily-wage/ad hoc/casual employees were still pending before courts. Consequently, several departments and instrumentalities did not commence the one-time regularisation process. On the other hand, some government departments or instrumentalities undertook the onetime exercise excluding several employees from consideration either on the ground that their cases were pending in courts or due to sheer oversight. In such circumstances, the employees who were entitled to be considered in terms of para 53 of the decision in Umadevi (3), will not lose their right to be considered for regularisation, merely because the one-time exercise was completed without considering their cases, or because the sixmonth period mentioned in para 53 of Umadevi (3) has expired. The one-time exercise should consider all daily-wage/ad hoc/casual employees who had put in 10 years of continuous service as on 10-4-2006 without availing the protection of any interim orders of courts or tribunals. If any employer had held the one-time exercise in terms of para 53 of Umadevi (3), but did not consider the cases of some employees who were entitled to the benefit of para 53 of Umadevi (3), the employer concerned should consider their cases also, as a continuation of the one-time exercise. The one-time exercise will be concluded only when all the employees who are entitled to be considered in terms of para 53 of Umadevi (3), are so considered. ground that they were irregularly appointed. This is nothing but a form of exploitation of the employees by not giving them the benefits of regularisation and by placing the sword of Damocles over their head. This is precisely what Umadevi (3) and Kesari sought to avoid. 9. If a strict and literal interpretation, forgetting the spirit of the decision of the Constitution Bench in Umadevi (3), is to be taken into consideration then no irregularly appointed employee of the State of Jharkhand could ever be regularised since that State came into existence only on 15th November, 2000 and the cut-off date was fixed as 10th April,2006. In other words, in this manner the pernicious practice of indefinitely continuing irregularly appointed employees would be perpetuated contrary to the intent of the Constitution Bench. 10. The High Court as well as the State of Jharkhand ought to have considered the entire issue in a contextual perspective and not only from the point of view of the interest of the State, financial or otherwise – the interest of the employees is also required to be kept in mind. What has eventually been achieved by the State of Jharkhand is to short circuit the process of regular appointments and instead make appointments on an irregular basis. This is hardly good governance. 11. Under the circumstances, we are of the view that the Regularisation Rules must be given a pragmatic interpretation and the appellants, if they have completed 10 years of service on the date of promulgation of the Regularisation Rules, ought to be given the benefit of the service rendered by them. If they have completed 10 years of service they should be regularised unless there is some valid objection to their regularisation like misconduct etc. 12. The impugned judgment and order passed by the High Court is set aside in view of our conclusions. The State should take a decision within four months from today on regularisation of the status of the appellants. 13. The appeals are accordingly disposed of. 14. We may add that that it would be worthwhile for the State of Jharkhand to henceforth consider making regular appointments only and dropping the idea of making irregular appointments so as to short circuit the process of regular appointments. 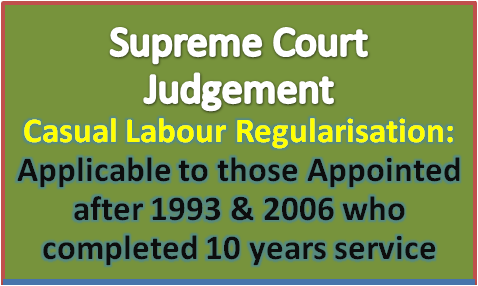 High Court, the Regularisation Rules provided a one-time measure of regularisation of the services of irregularly appointed employees based on the cut-off date of 10th April,2006 in terms of the judgment of the Constitution Bench. Therefore, since the appellants had not put in 10 years of service they could not be regularised.